Today, we are going to learn adverbs of place. 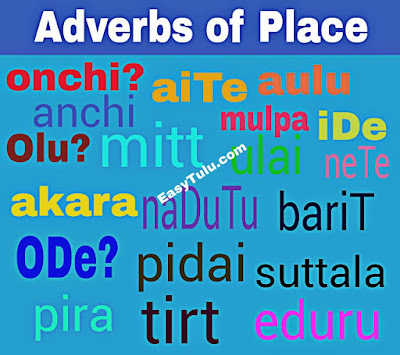 An adverb of place tells us where something is done or happens. 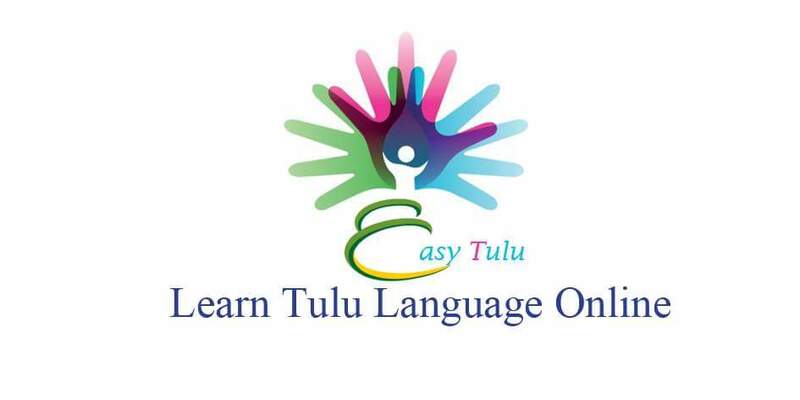 “Olla?’’ and “ONDu” are the short forms for “Olu ulla?” and “Olu uNDu?” respectively. yAn Ollae? – Where am I? I Olla? – Where are you? Aye/imbe Olle? – Where is he? Al/mOlu Ollal? – Where is she? au/undu ONDu? – Where is it? nama/enkulu Olla? – Where are we? Ir/nikulu Ollar? – Where are you? akulu/mokulu/Ar/mEr Oller – Where are they? undekulu/aikulu Olla? – Where are they? English: Where did he/she go? English: Where is your home? English: From where did you come? 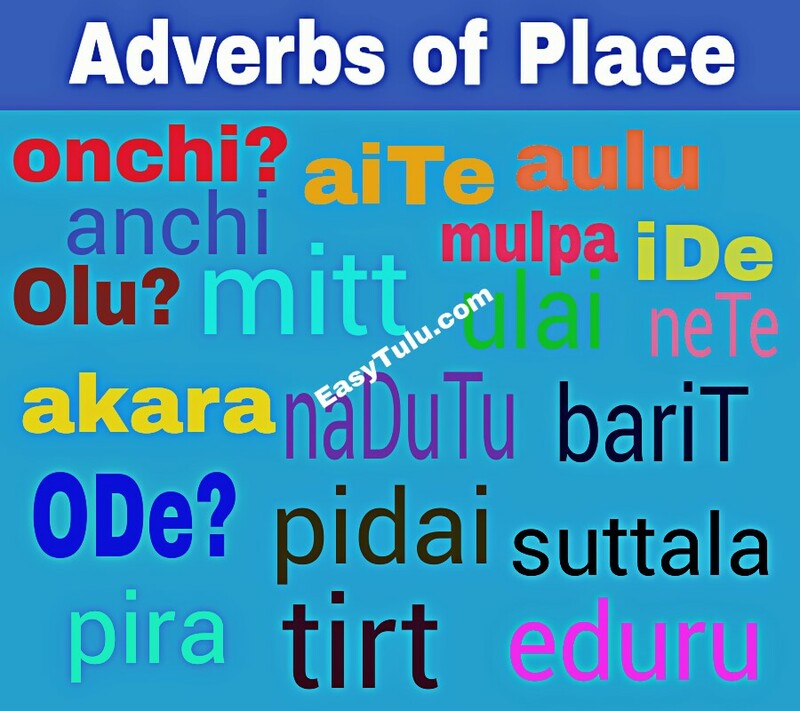 English: From which place you will depart? English: From which way wind is blowing? Kannada: gAli yAva kaDe yinda bIsuttide? English: My grand mother’s house is nearby. English: The cat is hiding under the table. Tulu: kaital’D Olla post office uNDa? English: Is there a post office anywhere nearby? Kannada: hattiradalli elladarU post office ideya? Tulu: mulpa bath room ONDu? English: Where is bath room here? Kannada: illi bath room ellide? 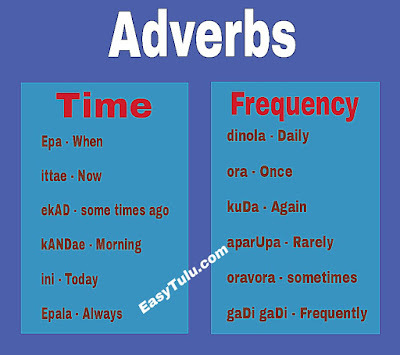 Adverbs are words that describe or modify a verb, adjective or another adverb. Generally it expresses manner, place, time, frequency etc. Today, we are going to learn adverbs of time and frequency. An adverb of time tells us when something is done or happens. An adverb of frequency tells us how often something is done or happens. English: When will he go? English: When should I come? Tulu: ittae I dAda maltondulla? English: What are you doing now? Kannada: Iga nInu Enu mADtiddIya? Tulu: inchipag I kuDlag pOtana? English: Have you been to Mangalore recently? Kannada: ittIchege nInu mangaLurige hOgiddIya? English: I came before you! You came later! English: I have never been to Mysore. English: I always wake up at 6 o’ clock in the morning.